With routing, perhaps more than with other branches of woodwork, holding the workpiece is sometimes the most difficult part of the job. 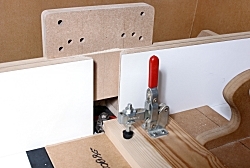 Straightforward clamping is often impossible without fouling the path of the router, so other methods have to be used. Here are some of the most useful. 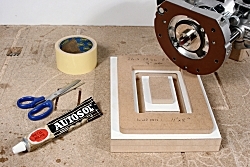 I use double-side tape to hold workpieces to my cu tting table for guide-bush work; fastening a pattern to the workpiece for batch work on a router table; fastening straight edges for trimming, making templates and numerous other odd jobs. The tape I use is heavy-duty carpet tape, which I buy from the local DIY superstore. The art of using it is to gauge how little is needed rather than how much, as the hardest part of the job is often releasing the workpiece after cutting. When you separate the pattern from the workpiece, a sticky residue is often left, especially if using Perspex or other plastics. To remove this, I use ‘Autosol’ metal polish. This removes the stickiness without damaging the surface of plastic. The hot-melt glue gun isn’t an alternative to ordinary glues but is very useful for temporarily holding materials. It pays to buy an industrial grade gun; the cheap DIY models are so low powered that the glue never reaches its proper operating temperature, consequently it cools far too quickly to position the workpiece. In addition, you’ll have a range of different glues for specific purposes and these will be more economic than buying little DIY sticks. When freeing the workpiece, the glue can be softened with a hot air gun, or with acetone. Several types of toggle clamp are available. 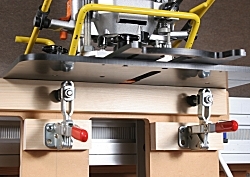 In the top photo, the rail of a door is clamped to a simple carriage that takes it past the cutter at an exact right-angle. The batten glued to the carriage aligns the rail at right-angles and prevents breakout. The bottom photo shows two toggle clamps screwed to the mortise rail of a WoodRat holding a piece for mortising. This is much quicker and easier than fiddling with orthodox clamps. The bar carrying the toggle clamps can be made as a bolt-on fitting and attached only when required. 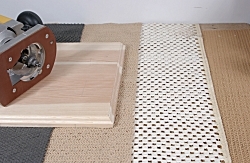 The router mat is simply sheet of one of the non-slip materials developed primarily to stop rugs and carpets sliding on hard floors. 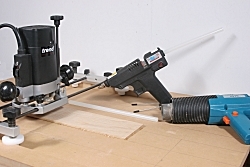 The mat is laid on an unpolished bench top, the workpiece is laid on the mat and the router taken to it as usual. My current favourite is a very thin material called ‘Rugstop’, but various versions under different brand names are available. Two things will reduce the effectiveness of the router mat: a build-up of sawdust, and prolonged exposure to bright sunlight. The UV in sunlight dries out the plasticisers and the mat literally loses its grip. Shaking the mat and brushing the bench top from time to time cures the first problem, and keeping the mat in a shady place when not in use deals with the second.